Shadow’s Symphony is the musical brainchild of Pennsylvania native Grant Smoker. 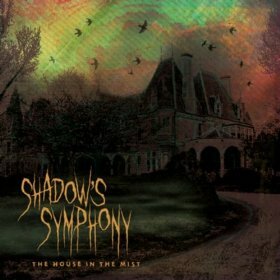 Shadow’s Symphony’s Facebook page touts their style as “haunting music from the darkness,” which I can’t say I disagree with after hearing their first album, The House In The Mist. The title track, “The House in the Mist,” immediately grabs your attention with eerily atmospheric opening (making it perfect to use when people first enter your haunt). The creepy buildup and wordless vocals in the background are great touches that add to its timeless feel. Great piano work hints at lost luxury in “Dust Covered Opulence,” which features the return of the first track’s spectral choir and other dark touches. “From the Grave” effectively combines a soft, eerie opening with wordless vocals while “Lost Memories” evokes the past with its combination of chimes, piano work and a unisex choir. The comparatively short “Darkness Lives” benefits from both a creepy buildup and wordless female vocals, which make it a bit more intense than last few tracks. “Out of the Shadows” is a great mix of piano and string work. Strings also shine in “Legend of the Ruins,” which provides a definite sense of age. The female vocals are appropriately soft and wordless for a ghostly feel, while some of the music even sounds like groaning. There are some plinking notes at times, but it never feels out of place. Similarly, “The Hands of Time” makes the listener think of antiquity with its soft, slow build to harpsichord-style music. Wordless female vocals get a real workout here. “Mourning Souls” is practically a continuation of the last track, but has its own darker touches, like a mix of tolling bells and wordless choirs moaning. In contrast, “All Have Fallen” uses a heavy, slow piano and only touches of wordless vocals, but the overall feel is just as effective. 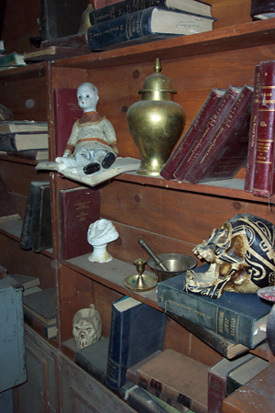 “Restless Spirits” creates a feeling of dread through its low buildup, making it perfect for springing on guests as they enter a particularly creepy hallway or room. Although the opening chimes provide a deceptively light tone, “Tragedy” soon becomes much more mournful and lends itself well to funeral parlor setups. “A Sinister Feeling” lives up to name with soft (but heavy) tones that increase in speed, along with some dripping-like notes that could let you use this in a dungeon or sewer scene. “Beyond the Witching Hour” uses wedding or funeral-like music after the opening clock-like notes, followed by bursts of speed. The atmospheric slow build of “Ghosts In the Dark” is rivaled only by its eerie piano work. The plodding tones of “Cursed Ground” create a sense of unease while heavy piano work effectively both opens and sets the tone for “Bound Within These Walls.” The soft touches of drums are a great touch. Heavy touches fill “The Haunting of the Crowley House,” along with a harpsichord-style opening and ghostly choirs. “Through the Night” starts with just voices for a great effect and soft music joins in later. “Reflections From the Other Side” has a very soft, slow build that sets the introspective tone for rest of song. The backing music here is fantastic. Finally, “The Dead Will Rise Again” is soft and ethereal at some times and showcases a menacing, plodding piano at others. In short, The House In The Mist is an amazing musical trip through a long-ruined place of former elegance, with wordless female vocals appearing in most of the tracks. I’m overwhelmed by both the sheer excellence of this album and the limitless potential it has for use in haunted attractions of all kinds (the older and more majestic looking, the better). It’s also great for use in theatrical séances. Each track can easily fit a variety of scenes while never sounding generic or bland and all but a handful lend themselves well for individual looping. Although some might not care for the lighter feel of certain tracks, I think that most people will be perfectly happy to play the entire album in a loop for their Halloween displays or haunted houses. In fact, it’s one of the best albums I’ve ever come across that comes the closest to my ideal of a perfect Halloween haunt soundtrack. In addition to this incredible freshman effort, Shadow’s Symphony has hit the ground running by releasing two new albums this year: Threshold of Forgotten Souls and Fairvale Funeral Parlor. In fact, I understand that one of the tracks from their most recent release is a direct sequel to a track from the subject of today’s review. I haven’t heard them yet but even if they’re only as half as good as The House In the Mist, they would still be definite must have’s for any Halloween buff’s collection. So rush out and pick this album up before Halloween, you won’t regret it. Special thanks to Shadow’s Symphony for use of the image! Gravedigger’s Local 16 is not to be held responsible for the content on or anything that may occur (be it good or bad) as a result of visiting any links on the above sites (or constructing a project that’s detailed on them). This also applies to the suggestions made here. Attempt at your own discretion.